Senior Pooch: You Can't Bark Out Loud When You're Smiling Like That! You Can't Bark Out Loud When You're Smiling Like That! 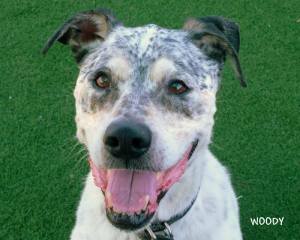 Woody's a good old boy, who's quiet, and is usually wearing a smile from ear to ear. He's OK with other calm dogs, but he'd rather just be with his people. He's perfect for an older person or couple. 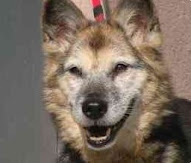 If you already have a dog, I'd recommend that you call the San Diego North County Shelter first to see if it makes sense to bring your dog with you if you want to meet up with Woody. More details on him are available at the Adoptions Page. This week I was lucky enough to have a short guest post called "Don't Look Away" appear in the Chihuahua Rescue of San Diego's newsletter and have another on rescue appearing on our friends at the San Jose Animal Advocates site in the coming weeks. The SeniorPooch.com Facebook Page continues to grow by leaps and bounds with new people sharing stories on their older dogs more often. The last few months have been exciting in participating for a number of events for The Dog Squad Rescue where I've joined as a board member. Next week I'm excited to announce a new project that I'm joining. I'm not sure what day my announcement will come out yet, but stay tuned. I'm betting it'll change the way that everyone thinks about shelters.